At the end of March, 11 PEPY Scholarship students and 11 Packer Collegiate Institute students from Brooklyn participated in a four-day exchange program together in Siem Reap. 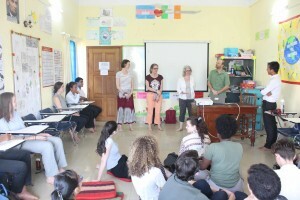 The objectives of the program were to learn and share about each other’s schools, skills, and cultures. During this exchange program, we did a presentation on PEPY’s history, discussed items brought up in previous pen pal exchanges further, made portraits, poetry using anaphora, constructed kites, created documentaries, and had fun singing songs. The results were positive, and students from both groups gained a lot of knowledge; this was largely due to the fact that the program was seen as a reciprocal learning experience in which each side had a lot to teach and learn. PEPY students reported learning a lot about American culture and the differences in lifestyles and school practices in Siem Reap versus Brooklyn. They were also happy to learn basic photography skills and improve their English language skills. Additionally, they improved their communication and translation abilities while students conducted interviews and took photos at the market, pagodas, or other public spaces. Makara: I was super excited to meet my penpal in person. She was such a great friend to me. She won the soccer game, she dances very well, and she is a very good photographer. We both shared a lot with each other about the education system in Cambodia as well as in the USA. A week together makes me feel in the moment and I love my new friend so much. Yinhyong: I don’t know which words I should use to describe what I felt. Obviously, I have learnt so much in terms of portrait shooting, dancing, and filming and interviewing people in the market. More and more, I get to meet my penpal who I can learn so much from. It’s a memorable moment of my life. Lida: I never touch and shoot on the camera, and I have no foreign friend too. Of course, a week in the exchange cannot teach me everything about the USA, photography, or about my penpal but truly, I have a better understanding about the USA than what I have ever heard since I started learning about it years ago. We will be in touch and we will meet again. Chantuo: What a wonderful exchange! I felt very happy that our school (PEPY) was partnership with Packer School. I learnt a lot within a week. My penpal is lovely and she is very helpful. She helps correcting my English and supported me portrait shooting techniques. We were sharing a lot about each countries education system and I taught her how to write Khmer letters and everyone in her family’s names. I will never forget this memory. Thanks million to PEPY and Packer for brought me and my friends to feel such a wonderful moment. As for PEPY staff, we really enjoyed every second working with Packer teachers and students. They were friendly and supportive. At first, they entered the PEPY office with lots of smiling and some words in Khmer so we felt like they cared about our culture and also valued our place. During the working days, their warm involvement in all activities and sharing of ideas made the exchange program better. We also learned helpful facilitation techniques from the Packer teachers. In fact, we think it would be useful to integrate a teaching lesson that focuses on the American education system in next year’s exchange. We also think more sports, art, and cooking lessons would make good additions to the program. In terms of challenges, we had to limit the number of PEPY students to join the exchange, which made some students disappointed. However, we hope to have more exchanges like this one by the end of the academic year so that all students will have similar opportunities. Also, PEPY students felt that their English was limited. So next time, there should be more staff to translate. Overall, this was a great chance for both groups to deepen their sense of global citizenship and to make new friends. We look forward to more intercultural opportunities like this one! Check out the original post from PEPY.